I have a love-hate relationship with farmers. I have a great deal of respect for the enterprise and for those who dedicate their lives to it. But, I also become annoyed at the culture in which modern American farming embeds itself. And, I don’t feel a lot of reticence talking openly about that. Having done plenty of farming myself, I don’t feel the need that so many others do to be extra nice to farmers out of lack of understanding. I know when the farmers complain about too little or too much rain, they are studiously ignoring the fact that if it is harder to plant or harvest, they make out like bandits with the price of their product. Farmers talk about how hard that life is, and yes, it is indeed very hard, but they seem to not mention that a typical large scale farm these days (as most farms are) is a multi tens of millions of dollars business sitting on enormously valuable land. Whenever things go really wrong with farms in the US, they get help. As it is now, we have some of the most bone-headed agricultural policies ever invented mainly to keep farmers happy, because so many US Congressional districts span vast farmland and little else. Have you ever heard of Mexican cheese? Or, more to the point, have you ever been to Mexico, and then, while there, had some cheese? That cheese might have been made in Mexico, but they don’t really make cheese in Mexico. Most of the cheese eaten there is imported. From where? From Wisconsin. Nowhere else. Why? Because of Clinton’s trade policies. Clinton made a bunch of sweet deals for American farmers and that was one of them. Rural farmers in Wisconsin voted for Trump, and Trump was the guy who was going to end NAFTA (and still might, who knows?). NAFTA keeps Wisconsin dairy and cheese in business. Get rid of NAFTA, Wisconsin becomes the West Virginia of cheese. Why? Because Mexico would rather buy its cheese from South America because it is cheaper, and the moment the Wisconsin dairy industry is not propped up by NAFTA, the free market takes over and California ends Wisconsin agriculture. Now, of course, there will still be farmers, but fewer. So few, perhaps, that most people who are all “oh, I’m a poor farmer, living out in the farmlands, help me help me,” can stop whinging and move to the city. A small number of technologists, mostly the children of former Mexican migrant workers because immigrants or the children of recent immigrants or migrants are the only people in America who still have ambition, will learn the technology and run the farms and, we hope, keep the robots happy and busy. There is a food crisis sneaking up on us right now. A lot of them, actually. A lot of little one, some big ones. There are always places in the world where food has become scarce for at time, and people starve or move. You’ve heard of the “”Syrian refugee crisis,” and the often extreme reactions to it in Europe and among some in the US. That started out as a food crisis, brought on by human pollution induced global warming in an already arid agricultural zone. Nearly similar levels of climate change related pressure on agricultural systems elsewhere has led to very different outcomes, sometimes more adaptive outcomes that won’t (at least for now) lead to major geopolitical catastrophes as we have now in the Levant and elsewhere in West Asia. What’s the difference? The difference is how agriculture is done. Are GMOs a solution? Are GMOs safe, and can the produce a small or medium size revolution in crop productivity? What about upgrading traditional agriculture to “industrial agriculture”? And speaking of GMOs, what is the latest in GMO research? How should GMOs be regulated, by the method they are produced, or by the novel or altered traits they have? How do we communicate about GMO research and GMO crops? What about labeling? These and many other questions are addressed ad Mike Haubrich, me, and Anastasia Bodnar talk about “Genetics and Food Security” on the latest installment of the Ikonokast Podcast. GO HERE to listen to the podcast. Also, if you go there, you can see a picture of Anastasia holding her latest GMO product, a corn plant that can see and talk! Also, Iknokast has a Facebook Group. Please click here to go and joint it! And, if you have not yet listened to our first podcast, with author and science advocate Shawn Otto, click here to catch up! According to the best available research, we are going to have to double food supplies, globally, by 2050. Think about that for a moment. Children born today will be in their 40s at a time that we need to have already doubled food production, yet during the last 20 years we have seen only a 20 percent increase in food supply. Assuming a steady rate of increase in production (which might be optimistic) we should expect to fall far short of demand over the next few decades. This is a problem. The problem is expected to most severely affect poorer people, people in less developed nations, and poor farmers, but if the entire world is double digit percentage points short of food, almost no one is going to get by unscathed. And, at some point, when nearly everyone is seeing some sort of food shortage or extraordinarily high prices, the totally unscathed are going to start looking pretty tasty to the rest of us. Also, agricultural production, whether for food or biofuel, has a fairly large Carbon footprint, both by reducing natural Carbon sinks and by using fossil fuels at a fairly high rate. Doubling production of food would presumably involve increasing these effects, unless alternative approaches are developed. So even if we solve the problem of production, we might exacerbate the problem of human caused climate change. Let us not even speak of sea level rise; Over the coming century we expect sea levels to rise sufficiently to flood, either regularly or permanently, some of the most productive agricultural areas in the world, which would seriously dampen efforts to increase productivity. And water. This will all require more water, when we are facing increasing shortages of water. How do we address this problem? Will Genetically Modified Organisms (GMOs) save the day? Are there other approaches to quickly increase agricultural output? Can we eat different foods that are less difficult or costly to produce? Emily Cassidy knows some of these answers. Emily is a scientist with with over five years of experience working on land use, agriculture, and the impacts of growing biofuels vis-a-vis developing food crops. She is currently a research analyst with the Environmental Working Group (EWG). Earlier she worked as a scientist with the Louisiana Department of Natural Resources, measuring impacts of coastal activities. Her Master’s degree at the University of Minnesota involved detailed modeling of global food availability, which involved developing a new index to quantify the number of people fed per hectare of cropland. This research was widely disseminated in mainstream media. Recently, Emily produced a report for EWG that looks at the role of genetically modified organisms (GMOs) in addressing the world’s food supply. You can get the report here. I had a few questions, so I interviewed Emily about this report as well as the larger issue of humans running out of food during the present lifetime of so many of us. Question: The amount of space, energy, and other resources dedicated to the production of meat is enormous. According to your EWG report, producing meat requires three-quarters of the agricultural land in use. For every one calorie of meat we produce we displace about 10 calories of plant based food. You also note that there is a huge amount of waste in the food stream, with about a third (by weight, about one quarter of the calories) lost. The US tosses closer to 40 percent, and of all the forms of food, a disproportionately large percent of meat is wasted. Having recently purchased, twice in a row (apparently you can fool me twice) “fresh” chicken at my local not-very-good grocery store that was rotten the next day, I was wondering where the waste in the food stream, especially for meat, was concentrated, and if we could help solve this problem by distributing meat primarily in frozen form. On food waste in the US, especially meat, do you have a breakdown of where the meat is wasted? I wonder if a switch to having almost all meat frozen and sold in frozen form would reduce a lot of waste. Emily: Meat production takes a massive environmental toll, and when we waste meat, we’re wasting all the resources used to produce it. About half of the meat wasted in the U.S. and Europe is tossed at home. Better meal planning and freezing meat could be a big step to reducing household waste. Although supermarkets have an important role to play in reducing waste, according to the Food and Agriculture Organization, only about 15 percent of meat waste in the U.S. occurs at supermarkets. foreseeable future. Relying on genetic engineering to double food supplies by 2050 would require a huge leap in biotechnology and doubling the recent yield trends of crops. Question: Are there any examples of GMOs being developed that will help with this that are not just vague promises? In other words, is there any tangible namable project or potential project you know of that would contribute to that “giant leap in biotechnology”? Emily: “Roundup Ready” corn and soybeans represent over 80 percent of the acreage growing GMOs, so it’s clear that the industry’s focus since the 1970s has been on genetic modification for herbicide tolerance. These crops haven’t improved yields because there are inherent biophysical trade-offs between productivity and pest resistance. This is why I wouldn’t bet the farm on biotechnology generating massive yield improvements. It’s similar to the live-fast die-young principle in evolutionary biology; plants are limited by their resources and can’t be good at everything at once. Not all forms of genetic modification are created equal. There are some projects which could be promising and aim to modify a plant’s genome to improve the efficiency photosynthesis. But it seems to me that most genetic modifications only see benefits in the short term, until evolution catches up to the new genome. For example, insects have evolved tolerance to Bt crops, and U.S. Farmers have been told to lay off of them. Where I do see exciting research that could really improve food security is the cross breeding of often ignored “orphan crops.” Just recently a new kind of drought-tolerant bean was bred by combining a modern bean with a variety traditionally grown by communities in the American Southwest. We should focus efforts and funding on improving the yields of nutritious food crops, not crops that mostly go to animal feed and biofuels. Question: On a related matter, how much does the the nature of the research itself ruin GMOs as a potential source of a modest or even minor agricultural revolution? It seems to me that helping poor farmers to be less poor will always lose to helping big corporations make more money, and the big corporations seem to be doing or funding most of the research. Is this a general pattern for ag research in general? In the old days big government money went into public universities to develop crops, technology, and methods that were available to all. The current system seems different. Is this a problem? Emily: Universities are increasingly reliant on private industry for agricultural research funding, and companies are a lot more interested in making money than improving the lives of poor people. Private spending for agricultural research is more than twice the public expenditures. Unless public research funding for agriculture improves, the future of our food system will be heavily influenced by companies seeking to make a profit. Question: I think a lot of people assume that technology will solve many of our big problems, such as food shortages and climate change. People are divided mostly into two groups: GMO Frankenplants will rise out of the ground and take us in the dead of night (I exaggerate slightly), or they will fix the future. You are suggesting, it seems, that neither of these scenarios is likely. Bottom line, what does your report tell us about GMOs and the medium term problem of people, the poor farmers first, not having enough food? Emily: There’s a myth that I often hear in Washington, that GMOs help the world’s poorest. If you really look into the evidence though, there’s no support for it. That’s why I wrote EWG report, to address ways to help small farmers, which is the real key to helping the world’s poorest. I’m not anti-GMO but I think we should be honest about their contribution to global food security and improving the livelihoods of poor people. Question: Current research suggests we need to double our food supply by 2050. But we’ve heard that before. In every decade there are predictions about future population growth or future agricultural productivity that suggest catastrophe, and we’ve passed many of those due dates for an expected Malthusian apocalypse. Is this projection different? Emily: Malthus assumed population growth would continue without limits. We know now that as people have more income, they generally have less children. Another result of people being wealthier us that they demand more meat and dairy. Recent research has shown that population will increase by about 30 percent by 2050, yet demand for crops is estimated to increase by 100 percent. This difference means that demand for meat and dairy is a bigger driver of crop demand than population.. We also have to keep in mind that many countries are starting to adopt biofuels mandates. Tim Searchinger recently estimated that if all countries met their food-based biofuels targets, it would be the equivalent of removing about 30 percent of calories out of the food system. 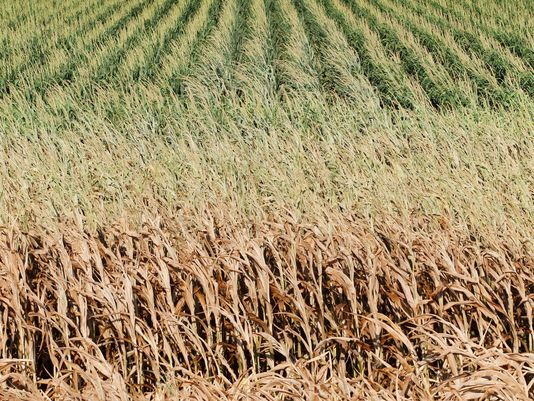 So depending on biofuels mandates, crop production may have to more than double to meet demands.These policies clearly threaten global food security. Emily’s report makes a series of specific recommendations that will close some of that huge gap in productivity vs. demand. She doesn’t mention eating the rich, but she does have a few other worthy suggestions. Eliminating food waste, shifting away from biofuels, and changing diets are all on the menu. So far, GMOs are not. I recommend that you read it and get working on this right away. Check out: The First Earth Day, an epoch journey into politics, explosions, folk music, and old boats floating on stinking rivers. We are seeing more studies linking climate change to potential or actual changes in agricultural production, and not in a good way. The report’s grim assessment for the state, designed to look at the business risks from climate change, is similarly gloomy for other Midwest states and their largest cities, including Chicago, St. Louis, Indianapolis and Minneapolis. Agriculture will be particularly hurt by climate change, it said, with corn, soybeans and wheat yields slashed as much as 85 percent by the next century in the leading farm states of Iowa, Illinois, Indiana and Missouri. Livestock also is expected to experience reduced productivity and other challenges.